A local court on Tuesday meted out a suspended prison term for a day care worker and imposed fines on two other employees and the head of the day care center for repeatedly abusing children under their supervision. 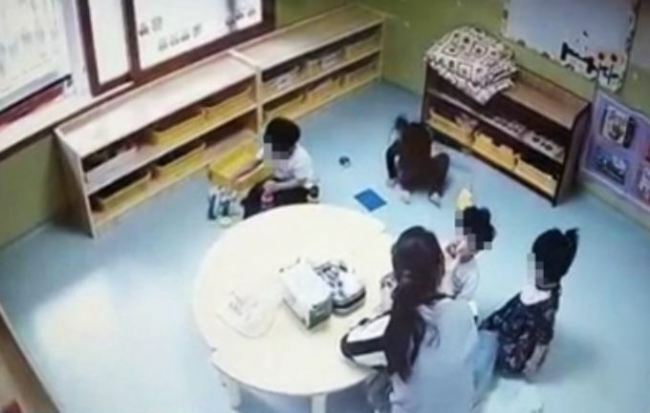 The Uijeongbu District Court sentenced a 22-year-old day care worker to four months in jail, suspended for two years. The court also ordered her to perform 120 hours of community service. The court handed down fines of 5 million won ($4,492) each to the head of the day care and a 33-year-old employee. A third worker, 23, got a 1 million won fine. In June 2016, a married couple living in Goyang, Gyeonggi Province, said they suspected child abuse after their 1-year-old son began crying and avoiding eye contact whenever they fed him. The couple asked the authorities to check the surveillance footage at the day care center, and the footage confirmed their suspicions. Video footage also showed the 23-year-old day care worker restraining both of the infant’s arms with one hand while spoon-feeding him even though he was gagging severely, police said. Investigators said they expanded the scope of the investigation to include the 51-year-old head of the day care center after a third employee, 22, was seen on camera poking the 1-year-old infant’s mouth and shoving a piece of watermelon down his throat. She then covered his mouth so he could not spit it out. The video footage showed the 22-year-old worker pulling another child’s hair and shoving the child in the chest. She was also seen shoving another child, who was playing with a toy. When the child got up from the floor, she took the child’s arm and slammed her into the ground.